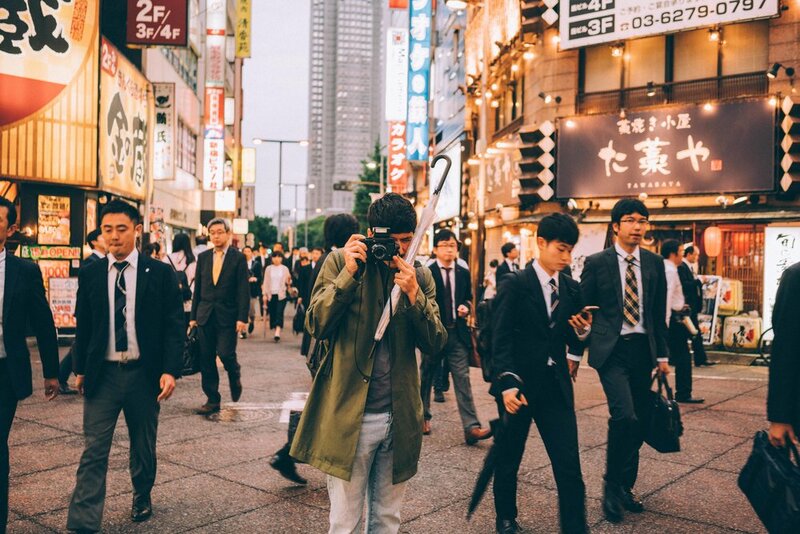 To launch Bellerose fw '18 collection, the Belgian clothing brand team asked us to go on a road trip around the land of the rising sun. We were very happy and curious to visit this amazing country. Here’s our 14 days journey starting in Tokyo. The first thing we did was visiting (very jet lagged) Yoyogui Park and Shibuya where we had lunch at Uobei Shibuya Dogenzaka, a sushi place where you order sushi and it comes to you rolling on a conveyor belt. 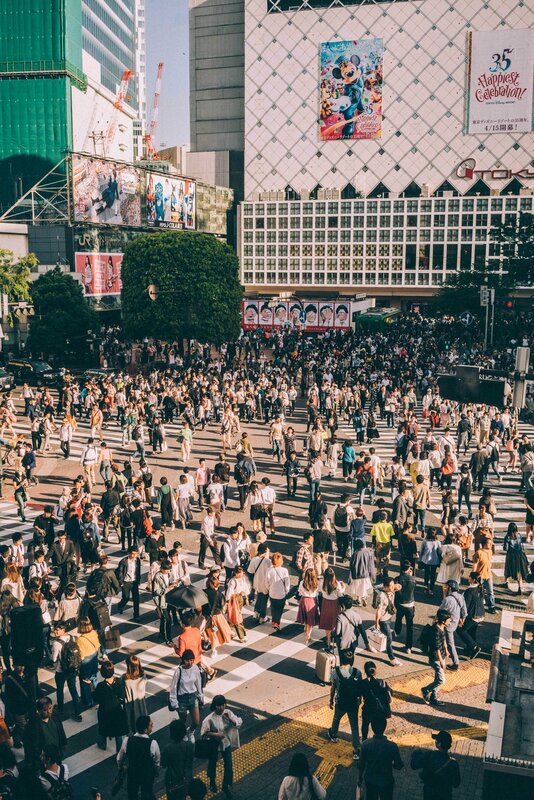 After that, we crossed the famous Shibuya crossing, where hundreds of people cross the street at the same time in all directions. On our first day, it felt very unreal—everything was shocking. For diner we went to a local place where the owners couldn't speak any english at all. We ended up eating raw calamari without knowing it and had to pretend everything was fine as everyone in the small restaurant was looking for a reaction. We walked around Ginza and its shops. The design and clothes we found really amazed us. In one of the most well-known shop called H Beauty and Youth, there’s a pizza place called Slice where you can grab a pizza surrounded by trendy Japanese people. In the afternoon, we had a walk around Akihabara which is well known for its arcade center and crazy Japanese video games. On the following day we visited Shinjuku because we wanted to buy new lenses for our cameras. Nuria got a crazy looking analog camera in a very small shop run by an old man who didn’t speak any English. We also climbed up the Tokyo Metropolitan Government Building where we got amazed by how huge the city is. 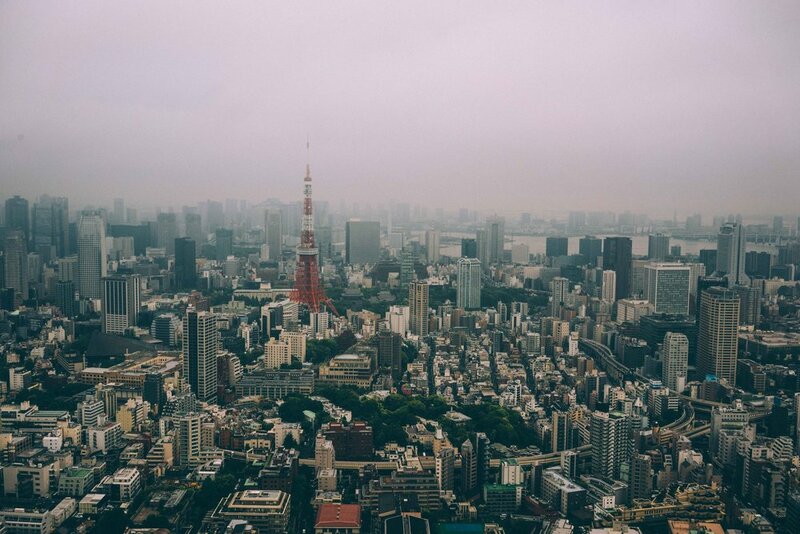 We visited the Mori Art Museum, one of our favorites in Tokyo—it has amazing city views. In the evening we went to our favorite book store in Tokyo, Tsutaya Daikanyama. We spent 3 hours going through their amazing book selection. We picked up the Japan Rail Pass first thing in the morning and left Tokyo to start our trip around the country. Our first destination was Kanazawa, so we jumped in the Shinkansen (high speed train). Kanazawa is a beautiful small city— very traditional and old fashioned. We went to the Omicho market and had a traditional Kanazawa dish called Oden. We then rented bikes and rode to the 21st Century Museum where we spent a lot of time taking pictures in the swimming pool installation from Leandro Erlich. We woke up early, rented bikes again and headed to the D.T. Suzuki museum. Its zen art and architecture was probably one of our favorite of the whole trip. For lunch we ended up going to an Izakaya restaurant and had one of our best meals in Japan: a traditional sea bass dish with rice served with miso soup called Nodoguro Meshi. We also visited the Kanazawa castle and walked around the old Geisha neighborhood. After a green tea matcha ice cream we went for dinner to a Japanese barbecue place called Chikichi where we met an employee and his boss who were having dinner together. They made us laugh so much even though we weren’t able to fully communicate because of the language barriers. After around 4-5 hours train we arrived to Kyoto. Our neighborhood was very cool and we had breakfast every morning at Efish café by the river where we also bought some souvenirs. That day we took the metro—which was way less crowded than the one in Tokyo— and arrived at the Fushimi- Inari temple. We climbed all the way to the top. At first we thought it was too crowded but once you start walking to the top you don’t feel like there’s so many people. In the evening we walked by the river and had dinner at an Italian restaurant since we needed a small break from Japanese food. The following day we went to the Golden Temple, it’s beautiful but it was really crowed so we decided to go for plan B : the botanical garden in Kyoto. As you can imagine, the botanical garden was wonderful. We took pictures around until they closed. We went to see the Face House building, which is really fun and curious designed by architect Kazumasa Yamashita. After a long walk, we met a friend who was around Kyoto at that moment, he’s from Canada and we knew him from Instagram. We met up and we had dinner at some restaurant where everything was cook with leek, very curious! On our way to Kinosaki we made a quick stop at Nara. We wanted to visit its temples and the Park which is full of deer! We had a nice walk and fed the deer with some special rice cookies that you can buy to local people. The deer sometimes get very excited and they even look in your pockets for more! We took a very long trip to Kinosaki because some friends recommended this small town where Japanese people go to spend some relaxing time at the onsen. Onsen are the traditional hotsprings baths in Japan. Men and women can’t bath together so we got separated at the entrance. There are many rules you have to follow to enjoy the baths, it’s very curious. One tradition is to wear the Yukata, a kind of robe that everyone wears all the time around town while going from one onsen to the next. We stayed at the most beautiful places in town : Nishimuraya Kinosaki hotel. We spent our time going to baths and walking around town, it's perfect to relax and get strength for the final stretch of our trip. We had lunch at Masuya restaurant, a traditional noodles bar, highly recommended! The following day we left to the UNO port where we stayed for the following days because it's where the ferrys leave to Naoshima and Teshima. As soon as we arrived we jumped on the boat to Teshima and we were really happy and excited! When we arrived we realized we had no bike reservation so it was really hard to convince the woman from the rental place to get one, but we finally got the last two! We went straight to Teshima art Museum, there's no words to describe how beautiful the building is, we spent like an hour just looking and hearing the sounds from Rei Naito’s exhibition. After that we got some beers and laid in the port until the next ferry departed. We woke up early and went to catch the ferry to Naoshima. It was Nuria’s birthday so we tried to make it as special as we could since we were away from Barcelona and our families and friends. We felt very lucky to be in Japan working on this project for Bellerose on Nuria’s bday, it made it super special and we will always remember it. This time we couldn’t rent bikes no matter how much we insisted so we decided to visit the island walking. We spent the day surrounded by amazing museums and artworks. We laughed a lot while queuing to take a picture together at Kusama’s pumpkin and after a long day we watched the sunset and I (Coke) gave Nuria her bday’s present which I carried in my luggage during all this days. Jumped into the ferry and went back to Uno. We spent the day travelling back to Tokyo in the Shinkasen. At this point we had been in Japan for almost two weeks so our first impression once we arrived back to Tokyo had changed and we realized that after the first layer there are many hidden characteristics of Japanese people and its culture that one can’t see in the first approach. We wanted to experience sleeping in a sky scraper in Tokyo and this is why we booked our last two nights in Park Hotel Tokyo. The views were outstanding and the sunset was out of this world. It was probably the best gift before going back home. We went for some shopping before going back to Barcelona.